FIANNA FÁIL HAS called on the social protection minister Joan Burton to rule out any cut to the free travel scheme. 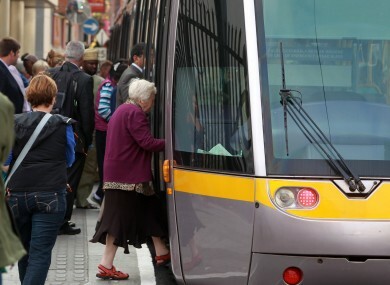 It follows news earlier this week that an interdepartmental working group has been examining the viability of the scheme which gives automatic free travel to anyone who is over the age 66, in receipt of carer’s allowance or who has a disability. Burton said yesterday and reiterated today that she “values” the scheme but concerns have been raised about the heavy losses that public transport companies incur in operating the scheme. This has led to speculation that the scheme could be means-tested meaning some people who currently qualify for the pass have it removed. In a statement this evening, Fianna Fáil’s social protection spokesperson Willie O’Dea called on Burton to rule out any cut to the scheme and said he had been contacted by dozens of people who were concerned their pass could be removed. “It is very disappointing that she stopped short of ruling out any cut to this much valued scheme. She must immediately do so,” he said. “The news that the scheme could be under threat due to a Government review caused anger and distress among thousands of older people who depend on their free travel pass. “I was contacted by dozens of people in my own constituency who were deeply concerned that their pass could be removed. If this threat wasn’t real, the Government should not have waited so long to ease their concerns. Email “Fianna Fáil calls on Minister to rule out cut to free travel scheme ”. Feedback on “Fianna Fáil calls on Minister to rule out cut to free travel scheme ”.